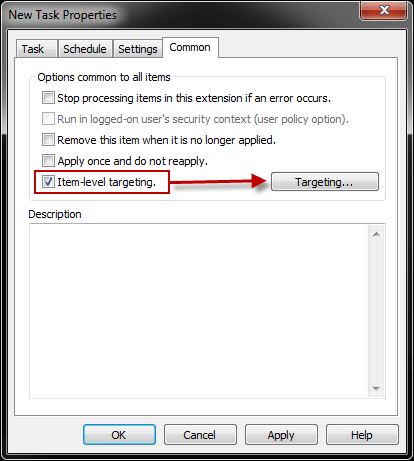 Item-Level Targeting (ILT) is a relatively recent development in the world of managing Active Directory, and often overlooked when implementing policies in the domain. Available only within a Group Policy Preference (GPP) item, an ILT allows further definition of a policy setting to make the policy even more granular than before. ILT also takes advantage of Boolean operators to apply attributes to logical questions, such as “If Value = Foo, Not Value = Bar”. Scenario: You want to assign a scheduled task to all computers in the domain, except those in the “Management” and “Admin” Organizational Unit (OU). Create a GPP and link it directly to the OUs that aren’t Management or Admin, and that would work – for now. However, if the domain is updated with new OUs, the policy would then have to be linked to the new OU, creating the need to write up a change control requirement, and so on. Too many details and steps to worry about. ILT eliminates the need for that type of oversight. Here’s how to use ILT to make this a “set it and forget it” GPP. Step 1: Get to the ILT options for the GPP item. Right click the scheduled task and choose Properties. Then click the Common tab and check the box next to Item-level targeting to enable the “Targeting…” button. Within the ILT screen, create a targeting item. The objective requires that Management and Admin OUs do not receive this policy, so choose “Organizational Unit” from the New Item drop down menu. Next, enter the path to the OU that should be filtered. Here is a generic “DC=domain, DC=local” domain (domain.local) as an example. 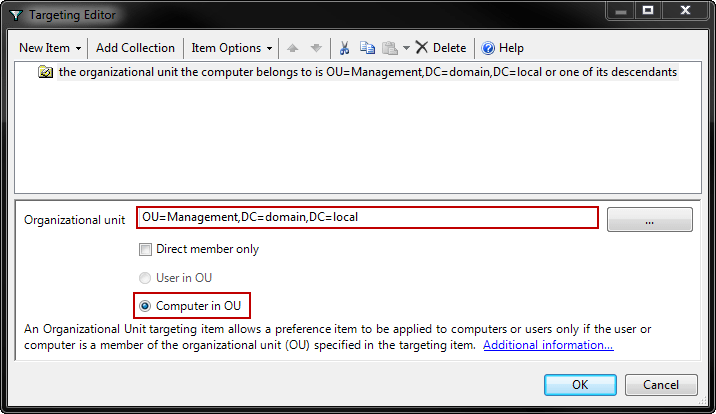 If unsure how to express an OU by its Active Directory path, use the browse (…) button next to the input box and search for the OU using the GUI. "the organizational unit the computer belongs to is OU=Management,DC=domain,DC=local or one of its descendants"
The last portion states “or one of its descendants” because the “Direct member only” box was not checked. If you only want the parent OU to be targeted, check that box. 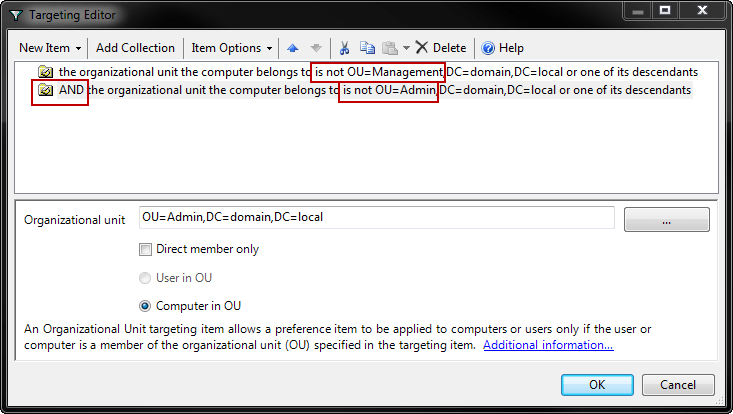 Create an additional targeting item that specifies the Admin OU. The default Boolean logic is “AND”, meaning both the targeting items must be true to successfully apply the GPP to the object. To reverse the selection logic, choose each targeting item and choose “Is Not” in the Item Options menu. The result is two targeting items that state “the organizational unit the computer belongs to is not” the OU path to both Management and Admin. The GPP can now be applied to a higher level parent OU, and the Management and Admin OUs will not be affected. New child OUs created later will also be included in the policy. Using modular GPOs/GPPs with descriptive names makes identifying the parent OU ILT policies easy when creating new child OUs. This is just one example of a relatively simple and direct use of ILT. However, there are many powerful features at your disposal, such as checking the OS of the computer, battery status, file/folder matching (including versions, great for updating software), and more. Given a complex boolean logic configuration within GPP ILT, when would the logic stop being processed? Would an entire logic tree be evaluated, or would the system stop processing the logic tree when a TRUE or FALSE answer is known? Thank you for the time in responses. Good question. If the client determines that it needs to evaluate the GPP object, it takes the logic sequence until it fails. As a best practice, it is a good idea to put the most rudimentary decision at the root and continue on with more granular logic as the ILT progresses. 1) Is this documented anywhere (kb, book, etc. ), or is this known through manual testing? 2) You stated the root, that could mean in a logic tree, or it could mean towards the top of the ILT interface. An example of desired functionality, would be a collection or item would be near the top in the ILT interface that would eliminate the most number of clients (to speed up processing), then collections further down would determine the specifics of the logic needed for the GPP. 3) Tangental topic: Is there any sense to the efficiency or speed of the logic processing? If there were over 50 items to process, would this be a performance penalty? There is a possible implementation where up to 100 AD security groups could be in a GPP ILT logic. If there is one LDAP lookup per group, there would be an average of 50 lookups per client (hopefully there is just one LDAP lookup, unsure on this still). The good part about processing the logic and dumping out when the first TRUE sequence is met, so the full logic tree doesn’t need to be evaluated. Again, thank you for your time. I have not found this documented specifically, but that is how most boolean logic works that I’ve encountered with Microsoft. I base this assumption on the fact that you can set the order of the logic items – if the logic did not run in serial, there would be no point in having an order. 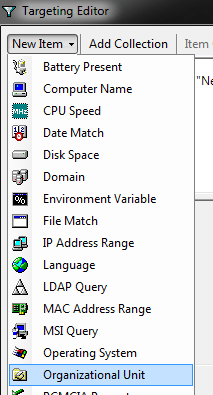 If you were filtering for something major, such as by OS type or computer type (laptop vs workstation), it would probably be faster to set a WMI filter on the GPO so that a failure would negate the entire policy/preference. i have tried something similar but excljuding domain controller OU, but it is still applying as it shows at rsop. The GPO’s apply to whatever OU they are applied to. However, the ITL tells the GPO whether or not to process the individual GPPs in the GPO. The RSOP is just showing that the GPO was in fact processed.